Home → Exhibits, News, Special Collections and University Archives → Special Collections Mini-Exhibit: Wear your politics! 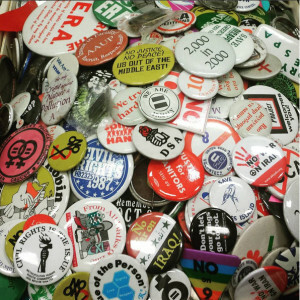 Special Collections Mini-Exhibit: Wear your politics! Colorful, humorous, emphatic, sassy, serious, right to the point: a slogan on a pin sometimes sums it up perfectly. Oregon politician Gretchen Kafoury saved thousands of political and campaign buttons during her two decades in public office, her work with the National Organization for Women and the Oregon Women’s Political Caucus, her career as an educator, and a lifetime of volunteer activism. PSU Library’s Special Collections has gathered part of Kafoury’s pin collection in a display which shows some of the causes and events with which she was engaged. We also feel that many of these pins’ up-front statements reveal the unflagging energy, enthusiasm, values, and leadership for which Kafoury herself is remembered. See the collection this summer in the display cases nearest to Special Collections in the first floor elevator lobby (south end), starting August 26, 2015. Gretchen Kafoury (1942-2015) was a politician, activist, and educator. She served in the Oregon state legislature from 1977 until 1982, on the Multnomah County Commission from 1985-1991, and as Portland City Commissioner from 1991-1998. Her political record and her life before and after public office show her dedication to economic and social justice, community development, women’s rights, health care, and education. She co-founded the state chapter of the National Organization for Women (NOW) and the Oregon Women’s Political Caucus (OWPC) in the early 1970s. Key issues for her as a legislator and commissioner included hospital care, aid for victims of domestic violence, job and credit assistance for low-income women, and affordable housing. 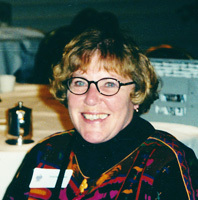 After her retirement in 2008, Kafoury donated a collection of documents from her time with NOW and the OWPC to Portland State University Library Special Collections. In 2015, her daughter Katharine made a second gift to Special Collections of documents and ephemera from Gretchen Kafoury’s political career. To access the Gretchen Kafoury Papers and other Special Collections materials, please contact specialcollections@pdx.edu to make an appointment.